Yeah ! Another tag to lift ! So, I die cut a tag with a Sizzix die in cream cardstock, and apply Spun Sugar distress ink all over it. I sprayed water over it and let it dry. Then as I choose to use Tim Holtz masks instead of a stencil and apply Walnut Stain over it. I used the same ink to distress the edges of the tag. I followed Tim's instructions and apply medium gel over another stencil to create the words and the date with embossing tinsel in copper (by Ranger). My bonus : I create an eyelet around the tag's hole using an embossing pen and with powder. As I didn't have an heart stencil, I created one with paper and heart punch. The red ink is Aged Mahogany distress ink. You maybe recognized the French picture of Doisneau, highlighted with markers, and I found deep burried in my stash some Basic Grey stickers (RIP). The metal heart is covered with embossing powder too. 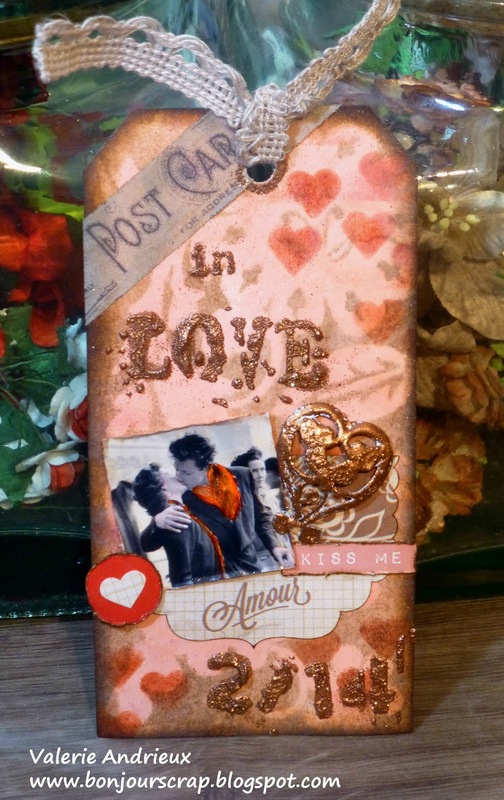 I added tissue tape (Tim Holtz) and lace (Recollections) to finish this tag. I did enjoy making this tag, and the one from February too. I will definitely continue with this 12 tags of 2016 !